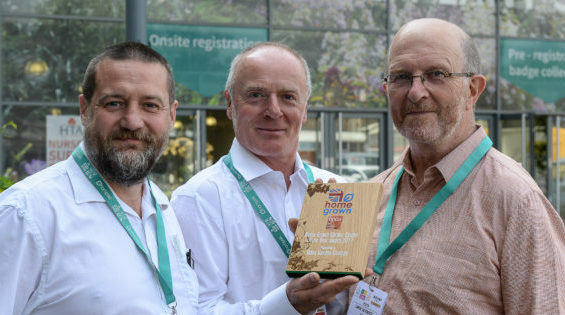 The Home Grown users group presented the Garden Centre of the Year award 2017 to Tates of Sussex, a well established, family company that has been active this year in promoting Home Grown produce. Records can trace the Tate family living and working on the land in the Sussex area as early as 1601. By 1782, William Tate was known in the Findon area primarily as a timber merchant, with Thomas and James Tate were working as blacksmiths and Sarah Tate as a dressmaker. By the 1870’s, the Tate family had extended into Portslade where Thomas Tate was landlord of the Clarendon Arms pub and James Tate worked as both a butcher and a shop keeper. After the war demand for cars surged, and suddenly Albert found both the engineering and the car firm very busy, so he approached his son John to see if he would run the car business. In 1982, horticulturist Jonathan Tate joined the family business and started about establishing a plant nursery in mid Sussex propagating unusual plants for sale to members of the public. Inspired by the new concept of the garden centre emerging in the UK, where people could visit and purchase everything they needed for their garden from one place, he set about developing what is now Tates of Sussex Garden Centres. The Home Grown labeling scheme, which promotes ornamental plants grown on British nurseries, was launched by the British Protected Ornamentals Association (BPOA) in February 2011. The idea for the scheme originally came from National Farmers Union (NFU) member nurserymen Morris May and Bill Godfrey, supported by their local NFU branch, who wanted to tap into consumer interest in local produce. Home Grown received pump-priming funding from the South East England Development Agency (SEEDA), then HDC supported its development into a label that growers could use in their marketing.